We are pleased to introduce our self as RATHOD INDUSTRIES SINCE 1974. Leader in manufacturing of domestic & Export Brass Transformer Bushing Metal Parts & Brass Fasteners Nut Bolts in India. 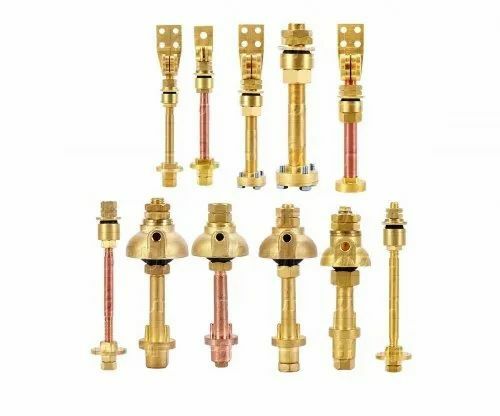 We are the foremost manufacturer, supplier and exporter of a premium quality range of Brass Transformer Bushing Metal Parts, Brass Fastener Components, Brass Energy Meter Components, Brass Fuse Components etc. The offered products are precisely manufactured using excellent quality material with the help of sophisticated technology as per the set industry standards. These products are widely acknowledged for their features like durable finish, high strength, smooth finish dimensional accuracy and robust construction. Our clients can avail these products from us in different specifications as per their exact requirements at market leading price.